Environment Minister Harsh Vardhan has said there is no need to spread panic among the people over the present air pollution situation in Delhi, adding it is not like the Bhopal gas tragedy which was an 'emergency'. The Delhi-National Capital Region region has been under a thick blanket of smog over the last one week. 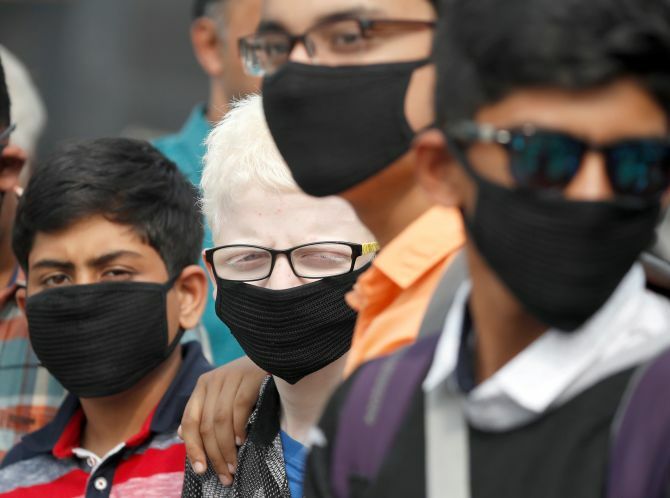 Doctors have declared the situation as a 'public health emergency', while the government has taken a series of measures in view of high pollution levels. 'I am talking in practical terms. You see, what happened in Bhopal when there was a gas leak and hundreds of thousands of people fell acutely sick and had to be rushed to hospital. We call that an emergency situation where you have to panic and you have to see what you have to do. 'I am not saying we shouldn't do anything about it (Delhi smog); everyone has to respond to what he is supposed to do. But there is no need to spread panic among the people,' the minister told News18. The Bhopal gas leak of 1984 is considered the world's worst industrial disaster where thousands of people died. He also emphasised that the air quality was improving. The air quality in the national capital showed marked improvement today and was recorded as 'very poor', but a Supreme Court-appointed panel is not planning to lift the emergency measures such as ban on trucks and construction immediately. The 24-hour average air quality index (AQI) of the Central Pollution Control Board (CPCB) was 308, which falls in the 'very poor' category, following a week-long smog episode when pollutants shot up to emergency levels.